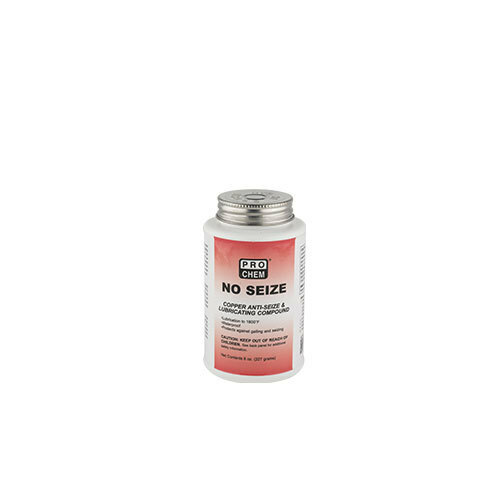 No Seize | Pro Chem, Inc.
NO SEIZE is a top quality antiseize compound that is composed of pure copper and graphite in a high heat resistant carrier. It resists galling, seizing and cold welding, and retards galvanic action between dissimilar metals. It also protects against rust and corrosion and will not wash off. With this product, you are assured long-term protection with one application, outdoors or indoors, even in damp areas or against salt spray. NO SEIZE can be used on copper, brass, cast iron, steel, all alloys, stainless steel, plastics and all non-metallic gasketing material. Clean surfaces before applying. (Dust from cleaning threads may contain metal powders, graphite, and silica quartz. Inhalation may cause lung injury or other harm. When grinding or wire brushing, use dust mask and safety goggles.) Do not dilute compound. Do not use for oxygen systems. Apply to both parts with brush. Straighten “bent brush” to remove last bit of compound. Keep container sealed when not in use.